This photograph has puzzled John Alsop for some time, and now a second copy has come to light annotated "Near Leeds". This may provide enough information for someone to come up with the location. If it is to be near Leeds, then my suggestion is Ravensthorpe. The station is on a slight curve and there are no hills to be seen - unusual in the West Riding! The Station is just on the Leeds side of the former Thornhill LNW Junction, having left the L & Y Main Line. It is a Down train. Could the location be Ravensthorpe, north bound platform, just after leaving the L&Y metals? I have a photocopy of another LPC card showing a Jubilee leaving Ravensthorpe taken from across the L&Y line which ties in with such details as can be seen on both. I think the suggestion of Ravensthorpe is spot on. Many thanks. Nice work! The identification of this station has solved another baffling mystery: the location of that beautiful shot of A-class 3-cylinder compound No 1822 in Ted Talbot's book LNWR Eight-Coupled Goods Engines. In that picture (plate 22), the goods shed at the left is clearly the same building as that on the right in Mystery Photo no. 48. The mills in the background confirm the location of both as Ravensthorpe & Thornhill (as it was known in LNW days). Harry Jack has pointed out that the two buildings on the right are identical with those in Plate 22 in my book LNWR Eight-Coupled Goods Engines. This picture has long puzzled Mike Bentley, who loaned me the original for the book (it is about the size of the mystery picture on the Webb site and has been beautifully enlarged to whole page in the book). Congratulations and many thanks from Mike and me to Peter Scott, Gary Wells and Harry Jack for finally cracking this mystery also. Browsing through some back-issues of the Journal I was pleasantly surprised to see that this photo had been used to illustrate an article by the late Neil Fraser in the September 1998 issue (Vol. 2 no. 7). The article was entitled Leeds Dewsbury & Manchester Railway (150th anniversary). 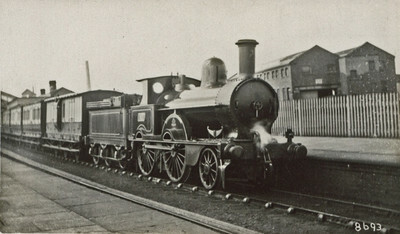 The caption identifies the location as Ravensthorpe and the loco as 'Whitworth' no. 81 Graystoke though a letter from John Goodman in a subsequent Journal corrects the spelling to Greystoke.